« Another Anti-Gun Pol Dealing Guns? The busy spring season for firearms and outdoor shows is wrapping up later this month as the NRA Annual Meetings & Exhibits speed into the home of the Indy 500. The annual event, which moves around the nation each year, will be held at the Indiana Convention Center in downtown Indianapolis from Friday April 25 through Sunday the 27th. 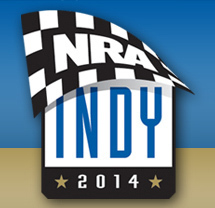 Attendance is free for NRA members and online registration is available now. If you are not already an NRA member, you can join online now and save $10 on your membership dues. NRAAM hosts over 600 exhibitors that cover more than 400,000 square feet of exhibit hall space, this show is sure to have something for everyone. Unlike SHOT Show earlier in the year, which is an industry-only event, NRAAM is open to the public, who spend the show’s three days visiting every major firearm and firearm accessory manufacturer in the country, seeing beautiful collections of priceless firearms and more. The GunLink crew will be there to capture the action and bring you coverage of the latest guns, gear and more. The event isn’t just about the exhibits, either! There are dinners and benefit auctions, leadership forums and entertainment including the NRA Country Jam and a special appearances by Alabama, Sara Evans and Lieutenant Colonel Oliver North at the Stand & Fight Rally. Exhibit hall hours last from 9AM to 6PM on Friday and Saturday, with shorter hours from 10AM until 5PM on Sunday. To make navigating the show easier, a mobile app is available for Android and iOS devices, as well as a mobile site for devices that are not compatible with the mobile apps. If you can’t make it to the NRAAM in Indy, be sure to mark your calendars for future shows, including April 10-12, 2015 in Nashville and May 20-22, 2016 in Louisville. If you are going, be sure to check in and share what you see in the event thread on the GunLink forums.